Practicing in his room, Splinter’s martial arts workout is ended abruptly by crippling back pain. Realizing he is no longer a young man, and pondering the knowledge of his own death brought back from the future, Splinter sits down to meditate on his past as Hamato Yoshi. He is approached by a spectral form of his older self, who takes him back to his youth in Hiroshima, where he learned martial arts from his great-uncle Gyogi. When Gyogi was blinded by the atomic bomb blast in 1945, Yoshi and Gyogi went to stay on their cousin’s farm, where Gyogi continued teaching Yoshi the art of ninjutsu. Yoshi then left to study at the University of Osaka where he met others like himself and founded the Foot Clan to embrace a humanitarian approach to ninjutsu. Leaving his top student, Oroku Saki, as chu-nin in his absence, Yoshi travelled to Tibet to study at the feet of the Charlie Llama. When Yoshi returned, he was greeted by Saki with news that the Grand Master Yamaguchi would be inspecting the Foot Clan soon. Unbeknownst to Yoshi, Saki chose this as his opportunity to strike. Sending notes to both Yamaguchi and Yoshi to meet in the yard at the same time, Saki murdered his fellow student Saburo with Yoshi’s katana. Just as Yoshi stumbled upon the crime scene and picked up his blade in horror, Yamaguchi arrived and came to the conclusion that Yoshi was the murderer. Banished from his homeland of Japan under pain of death, Yoshi fled to America. Finding America to be “a land of waste and over-consumption” (what, like Japan isn’t? ), Yoshi took refuge in the sewers. Back down memory lane, Splinter recalls the days when, as Yoshi, he found the four baby turtles covered in a green ooze. Setting down his pet rat, Ogata, Yoshi cleaned the turtles up. What he discovered later was that the ooze was mutagen. While he passed on his human traits to the turtles, mutating them into intelligent anthropomorphs, Ogata passed on his rodent traits to Yoshi, mutating him overnight into a rat-man. Not immediately able to walk with his new anatomy, Yoshi began using a walking stick for aid. The turtles took to calling him “Splinter” in response to the old stick, leaving Yoshi to discard his former identity and take on the new name. He then began training the Turtles in the martial arts, knowing that they would need to defend themselves in a world that would fear them for being different. Eventually, he gave them names inspired by his favorite Renaissance painters: Leonardo, Donatello, Raphael and Michaelangelo. Many years after that, New York City came under siege by the corrupted Foot Clan, now led by Oroku Saki. Going by a new identity, The Shredder, he quickly became the Turtles’ greatest foe. Those adventures eventually led to many new and bizarre ones. Splinter is then awoken from his meditation by noises in the living room. He walks out to find the Turtles and Ninjara setting up decorations for a birthday party. His birthday party. Apparently, in all his contemplation, he forgot that it was May 11th. As Ninjara gives him a kiss on the cheek, Splinter blows out the candles on his cake, considering growing one more year older to be a “pleasant surprise”. *The framing device of this story is continued from TMNT Adventures #44. The story continues in TMNT Adventures #46. *This entire story is an updated summarization of the entire TMNT Adventures comic book series. There are two notable retcons, the first being the circumstances surrounding Hamato Yoshi’s banishment from the Foot Clan being altered, remaining similar but being less comical and more dramatic. The second being the Turtles mutating into babies and raised as children, as opposed to the scene as depicted in TMNT Adventures (miniseries) #1, where they were instantly mutated into teenagers. *Splinter will celebrate his next birthday in "The Fifth Turtle". 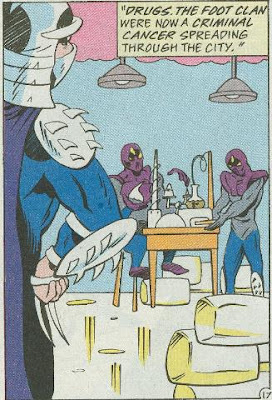 *Splinter is troubled with thoughts of his own mortality, as he was told of his death in TMNT Adventures #43. *Splinter first recounted his youth spent with his great-uncle Gyogi in TMNT Adventures #29. *Splinter’s history with the Charlie Llama was touched upon in TMNT Adventures #33. *The origin of Splinter, the Shredder and the Turtles was first recounted in TMNT Adventures (miniseries) #1. *Splinter’s flashback montage on page 20 shows generic images of Bebop & Rocksteady, the Shredder & Krang, the Turtles wrestling Ace Duck and Cryin’ Hound from TMNT Adventures #7, Scumbug and Wyrm battling each other from TMNT Adventures #10 and the Turtles reuniting with the Mutanimals from TMNT Adventures #38. *Donatello and Leatherhead takes place between this and the next issue. *This issue also included a Gary's Gag Page, "Meanwhile in Dimension X". *This issue was published in the UK by Fleetway as TMHT Adventures (#81). Ah, that ever reliable comic book filler tradition: the origin flashback. It’s less common now, but for decades the quick and easy way to get a title through another month while the major story arcs were being ironed out was a slapdash “modern retelling” of the title characters’ origin. Iron Man did it God knows how many times, going through my back issues and reprints. Tired though it may be, this trope offers at least a few positive opportunities. It allows the authors to update the origin and streamline it to match the modern interpretations of the characters. All the elements of Splinter’s history seen in this issue were touched upon non-chronologically throughout the run of TMNT Adventures. Here, Steve Murphy (Dean Clarrain) and fill-in writer Phil Nutman present them all in proper order, giving us a better feel for the cryptic history of Hamato Yoshi. And once the narrative progresses to the early years of TMNT Adventures, it makes a decisive effort to eliminate certain elements of goofy humor leftover from the Fred Wolf cartoon, exchanging the lighter tone with more gruesome drama. Rehashing the origin also allows for some insight and fresh details on the story we already know by heart. 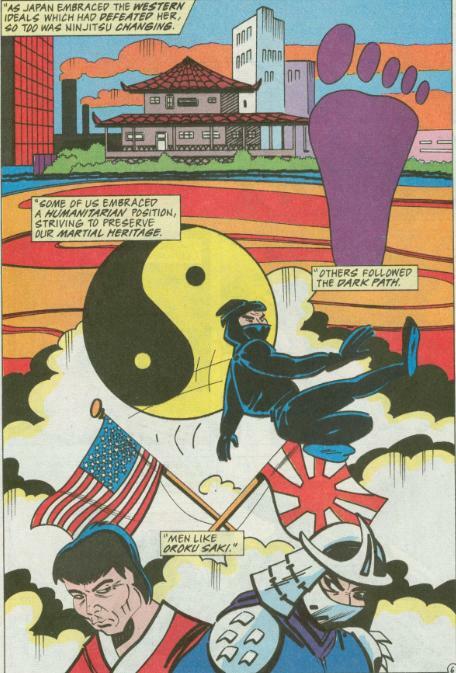 Elements such as Splinter’s history with Gyogi, the Charlie Llama and even Oroku Saki were only ever seen briefly in previous issues, but here we get some richer back story on that (though I would have liked some more time to have been spent on Saki’s history as Yoshi’s student). We also get names for bit characters who never had them before, such as Grand Master Yamaguchi and Yoshi's pet rat, Ogata. Still, it’s full cover price for a story we pretty much already know and another month of waiting for the narrative to progress. So give and take, push and pull. Ken Mitchroney, former main artist for TMNT Adventures, returns to draw this filler issue. His art seems somewhat rushed in places, again solidifying this as a last minute chunk of filler. He can’t seem to keep Yoshi’s face on model from pages 3 through 6, but eventually settles on a countenance and sticks to it for the rest of the issue. 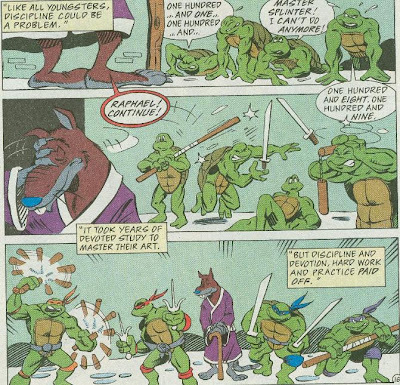 His humorous style shines best on page 16, as the Turtles struggle to train while Splinter shakes his head in defeat. And though I know it wasn’t meant to be funny… Foot Soldiers operating a meth lab? So far as filler stories go, I’d much rather have something like this than TMNT Adventures #26 or TMNT Adventures #27; wretched, meaningless environmentalist yarns about recycling and proper disposal of toxic waste. And though I don’t think it necessarily needed to update certain parts of the origin to remove the humor (I never had a problem with it), I am glad they “set the record straight” on the Turtles mutating into babies instead of directly into teenagers. I wonder what Mitchroney was using for reference on those foot soldiers. The manual to the first NES game? Back issues of Nintendo Power? I guess he forgot how to draw them. Still, I remember this issue fondly mostly on account of the art and pin-up-esque page layouts. The one thing I'll say the Fred Wolf toon got right over all other incarnations of the media (aside from the existence of Krang) is that it makes a ton more sense (from a dramatic standpoint) for Splinter and Hamato Yoshi to be the same person than for Splinter to have been Yoshi's pet. Good for TMNT adventures for keeping that part in. Always was dissapointed in the break from Chris Allan's art in this issue, but did love Laird's work on the cover! Next up will be some interesting issues. Bring it! From a dramatic standpoint, E. Wilson? Could you elaborate? Sure, I can see how "Yoshi is Splinter" makes more sense from a logical/suspension of disbelief standpoint (at least, until you factor in the mutagen) but whether or not it makes for better drama would really depend on what the story is. For example, I feel that a Splinter who was also Hamato Yoshi would have never trained the turtles to serve as instruments in his revenge against the Shredder--it would feel out of character, since the "honorable" thing to do would have been to face him himself. Perhaps I'm the only one EVER to point this out, but, uhm... What age are Splinter and Shredder anyway? For some reason, in whatever media outlet Splinter appears in, he's always being portrayed as an elderly person - whether his original form was a pet rat or Yoshi himself. If the Turtles were indeed mutated into teenagers directly, like in the Fred Wolf cartoon, then it would have to mean Yoshi was already of considerable age when he mutated into a rat. Yet Saki doesn't appeared to have aged at all in the time in between (they appear to be students of the same age). Same goes for the theory presented in most other incarnations of the TMNT origin story, where the Turtles grow up as children rather than mutating into teenagers directly. It takes 15 years between the Turtles and Splinter mutating and their encounter with Shredder, yet Splinter's geriatric and Shredder's still about the same age. In this issue of the Archies, it appears Yoshi was already around in 1945. 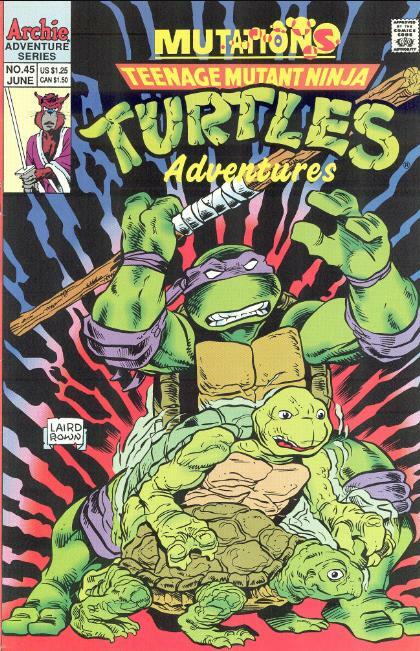 Even if he was only 5 in 1945, that would mean Yoshi/Splinter was almost 50 at the time TMNT Adventures #1 takes place. Since Saki/Shredder is a student of Yoshi, it would mean he's a bit younger, though they pretty much seem about the same age at the time they first meet. Even if the original origin story gets retconned in this very issue, it still doesn't make a whole lot of sense UNLESS Oroku Saki is notably younger than Hamato Yoshi. E. Wilson noted that from a dramatic point of view it's more interesting that Yoshi and Splinter are in fact the same person, but from a chronological point of view, it falls rather flat. If Splinter was indeed a pet rat which mutated into the Turtles' sensei, the apparent age difference between Splinter and Shredder would make more sense. Alas, the average age of a rat is far below 15 years, and in that case Shredder could still be under 40. In that light, the new origin story in the IDW books might make a bit more sense, since the time lapsed between the mutation and the Turtles kicking into action is only 15 months instead of 15 years. That could make Shredder (assuming he'll appear in that comic) considerably younger than in all other formats. Though I'm not really buying Eastman's reincarnation perspective, how dramatic it may be. That would mean the bad guy reincarnates as a human again and the victims of murder as a lab rat and terrapins? I don't really think Buddhists would agree on that explanation of reincarnation. But what the hell do I know. P.S. : between various media outlets, the Turtles were born anywhere between 1969 and 2010. A useless fact, but makes ya think, right? Right!?! Loved those toys, though. Like TMNT and Transformers had a baby. I'm reading the 1993 Archie material for the first time. The retcons in this issue aren't too bad on principle. It just bugged me that they came RIGHT after the acknowledgement of Fred Wolf continuity in the Future Shark trilogy. For a moment, I thought they were actually providing an in-universe explanation for the shift away from TV adaptations following issue #4. Framing the Archie universe, from Shredder's timeslip escape onward, as some sort of divergent timeline of the cartoon would have been neat. But issue #45 makes it clear that it's just the typical "comic book is different from the show/movie/other comic/etc" scenario... oh well!